Esquilino is named for the Esquiline hill on which it stands. It lies south of the Termini station and centers more or less on the Piazza Vittorio Emmanuele II. It is now partly a Chinese immigrant neighborhood, and specialty groceries and shoe stores abound. (There is also still some disgruntled graffiti to be found lamenting this fact, such as "Esquilino - White and Catholic. Defend it with us."). San Giovanni is named after the Basilica, which is the parish church of Rome. The area is south-east of the Esquiline. Metro Line A connects Termini station with the basilica of San Giovanni. There are also several buses from the downtown area, best caught at Piazza Venezia or by the Colosseum, where you can connect with Metro Line B. 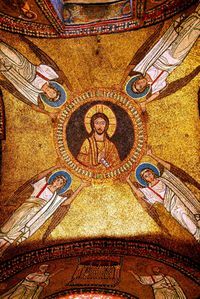 The Baptistery of San Giovanni: Superb inside! Movies are shown and some performances are held for free in Piazza Vittorio during the summer. Punto Thai Massage Rome – Via Acqui, 21 . Telephone +39 6 70614249 • Fax +39 392 0586661. A modern massage centre to enjoy this antique art of Thailand to relax your muscles and body after a long day of work. Several the massages and treatments offered, including the Turkish bath. 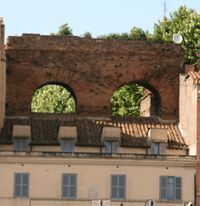 The Punto Thai Massage is located in the Appia Nuova district, behind the Saint John Basilica. The area is also home to the Mercato Esquilino, an indoor market of ancient provenance that recently moved from its longtime outdoor home all the way round the outside of Piazza Vittorio; it is still only a couple of blocks east of the piazza. The mercato is divided into a food section, with good and cheap produce, meat, and fish, and a clothing section, with clothes of all kinds, shoes, luggage, etc. at low prices and generally not fabulous quality. Get there in the morning for food; it's generally closed by afternoon. There are a lot of Chinese and Indian restaurants, but you will also find many typical trattorias. B&B Laura – Piazza San Giovanni in Laterano 26  Telephone +39 334 2059616 • Bed and Breakfast of Rome with double and triple bedrooms with private or shared bathroom, hairdryer, shower and breakfast included. Double rooms price starting from 60 Euros. 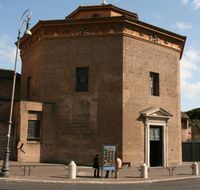 Domus Sessoriana Rome - P.zza S. Croce In Gerusalemme, 10, 00185 Roma, Italy. • Telephone +39 06706151 • Fax +39 067018411. Sixty bedrooms divided in single, double, double, triple and quadruple with private bath, shower, satellite TV, air conditioning and breakfast included. Rates: Single: €53-€108; Double €63-€135. Maikol Family Guest House Rome – Piazza Vittorio Emanuele II, 138 - 00185 Rome, Italy. • Telephone +39 06 4940789 • Fax +39 06 49382291. Wide range of bedrooms with flat-screen TV, safe and minibar, private bathroom, shower, free toiletries, hairdryer and Wi-Fi connection. Rates: Single €60-€120; Double €100-€180. Breakfast included. Relais La Torretta Rome – Circonvallazione Appia 126, Cap. 00179 Rome, Italy  Telephone +39 3476120628 • The guest house Relais la Torretta offers single, double and triple rooms with private bath, shower, air conditioning, free wi-fi and complementary breakfast buffet. Duble and twin: Euro 38. Residence Lodi Rome – Via Fanfulla da Lodi, 45  Telephone +39 6 87450659 • Fax +39 6 87450949. The Residence Lodi Rome presents a wide choice of self-catering apartment for 2, 3 and 4 people with kitchenette, private bath, air conditioning and colour TV. Double apartment €47. Imperial Rooms Rome – Via di San Giovanni in Laterano 10, 00184 Rome, Italy. . Telephone +39 06 9799 6832. Bedrooms with a living area, satellite TV, internet connection, telephone and private bath with shower. Double and twin standard with breakfast included: E. 89. Romoli Hotel Rome – Via della Caffarelletta, 114  Telephone +39 6 78349830 • Fax +39 6 78851368. Three star hotel with single, double, triple and quadruple guestrooms. All with en-suite services, shower, free Wi-Fi internet connection and breakfast included. Double rooms from €56. This page was last edited on 25 May 2017, at 21:24.